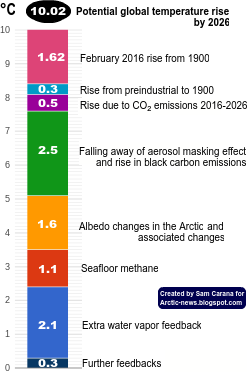 Arctic News: How many deaths could result from failure to act on climate change? How many deaths could result from failure to act on climate change? A recent OECD study concludes that outdoor air pollution is killing more than 3.5 million people a year globally. The OECD estimates that people in its 34 Member countries would be willing to pay USD 1.7 trillion to avoid deaths caused by air pollution. Road transport is likely responsible for about half. 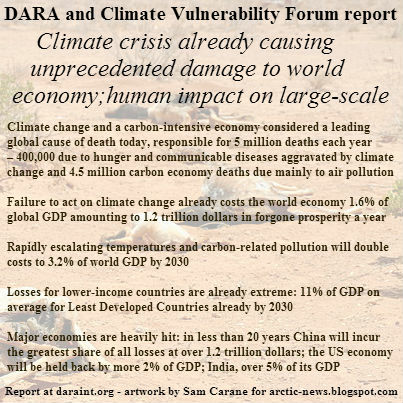 A 2012 report by DARA calculated that 5 million people were dying each year from climate change and carbon economies, mostly from indoor smoke and (outdoor) air pollution. Back in 2012, a Reuters report calculated that this could add up to a total number of 100 million deaths over the coming two decades. This suggests, however, that failure to act on climate change will not cause even more deaths due to other causes. Indeed, failure to act on climate change could result in many more deaths due to other causes, in particular food shortages. As temperatures rise, ever more extreme weather events can be expected, such as flooding, heatwaves, wildfires, droughts, and subsequent crop loss, famine, disease, heat-stroke, etc. So, while currently most deaths are caused by indoor smoke and outdoor air pollution, in case of a failure to act on climate change the number of deaths can be expected to rise most rapidly among people hit by famine, fresh water shortages, as well as wars over food, water, etc. How high could figures rise? Below is an update of an image from the earlier post Arctic Methane Impact with a scale in both Celsius and Fahrenheit added on the right, illustrating the danger that temperature will rise to intolerable levels if little or no action is taken on climate change. The inset shows projected global number of annual climate-related deaths for these two scenarios, i.e. no action and little action, and also shows a third scenario of comprehensive and effective action that would instead bring temperature rise under control. For further details on a comprehensive and effective climate plan, see the ClimatePlan blog. Rising temperatures and declining annual runoff in dry regions that cause drought, surface water evaporation and drying soils, will lead to a further northward spread of the pine and spruce beetles, which will lead to worsening wildfires, and more black carbon soot being deposited on Arctic and Greenland ice and snow, changing its albedo to a darker color and hastening melting there. The gradual loss of surface water supplies causes an ever more rapid drawdown of aquifers, which will eventually render large areas of our planet uninhabitable by urban populations. Right now about 2/3rds of our planet's 100-largest urban areas are included in this forecast, and eventual refugee flows will overwhelm any chance of sustainability across huge areas of our planet. Right now average planetary warming of just 3.5 to 4 degrees Celsius results in the loss of close to half of world farmland as well as causes between 2 and 3 billion people to become refugees due to water supply and food supply scarcity, as well as causes rising sea levels which could rise by 3-5 meters (or 10-16 feet) forcing hundreds of millions of people away from ocean shores too. According to the recent US National Climate Assessment water supply scarcity and a declining supply as temperatures rise due to ongoing climate change is our number one worry, along with the effect that rising temperatures have on crop yields. Even here in metro-Denver, regarded as one of the most-sustainable urban areas in North America, in the last year Denver Water was already said that the Denver Basin Aquifer's current depletion rate and our water demand growth rate meet between 2025 and 2027, after which time substantial reductions in water use will be necessary. As long as urban areas like metro-Denver can isolate themselves and their water supply from desperate hordes of water-scarcity refugees everything will be fine for some time, but even today there is no spare water supply in half of the Continental US, in-fact many areas across the greater Southwestern US are already in severe water supply shortage. All that it will take to send tens of millions of water scarcity refugees flooding northward and eastward from Mexico and the Southwest US will be a rise of 2.5 to 3 degrees Celsius, and Denver nor any other urban area within 700-800 miles of here has any spare water supply either. Worse yet such an outcome will cause a huge economic downturn as property values collapse across the stricken region, which will make mitigation of the issue much less likely too. Just so everyone knows, a rise of 6 to 7 degrees Celsius in global average temperature is considered fatal to almost all of humanity except isolated pockets on the surface in inland areas near large, deep, and cold bodies of water in near-perpetual shade plus whatever amount manage to survive underground, which might number a half-million people in a pinch. 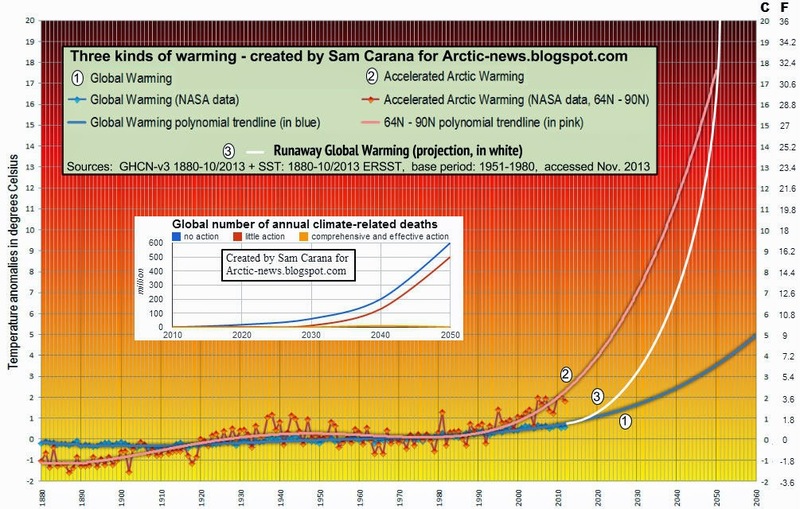 So if we reach 6 to 7 Celsius of warming the death toll will be about 9 billion people, and as it is plain to see on Sam's chart that we exceed 6 to 7 Celsius of warming by 2040, and even according to the recent average of Michael Mann, the US National Climate Assessment, and David Spratt, we exceed warming of 2.5 Celsius by 2050 with a 25-30 year lead time necessary to hold temperature rise, which means that we will have to reduce man-made GHG emissions by 80-90% by 2025 at the latest to hold warming to 2.5 Celsius by 2050. 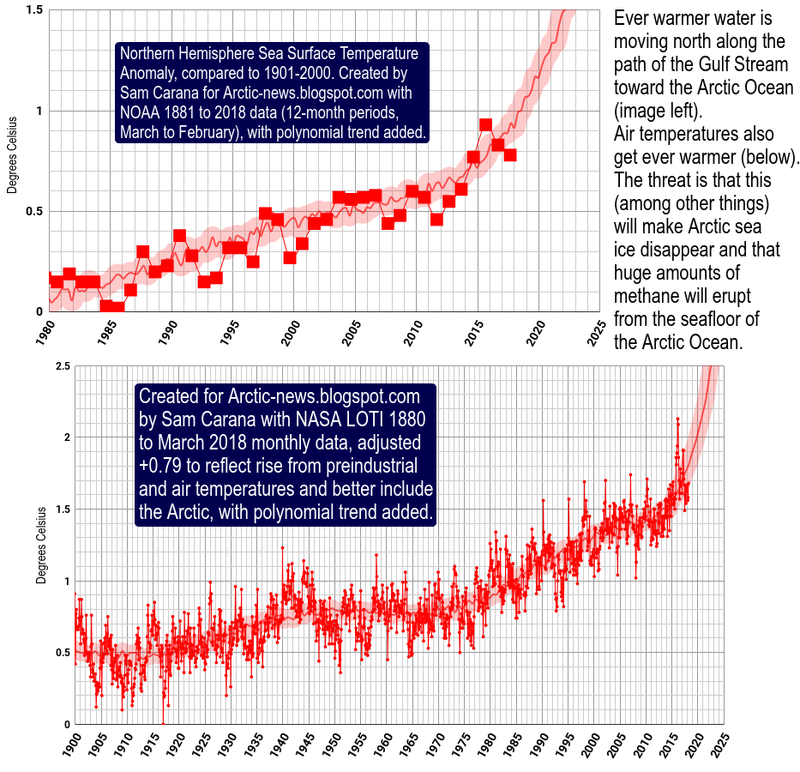 Let's hope that the Arctic News and IARC team isn't correct in their prediction but they have a record of being correct many times already too. Thanks Sam for helping to point out the increasing difficulty that ongoing climate change presents to the long-term survival of humanity. New study finds that Poor air quality kills 5.5 million worldwide annually. Also see the infographic (pdf) Air pollution was responsible for 5.5 million deaths in 2013. In a 2014 news release, the Wold Health Organization (WHO) reported that in 2012 around 7 million people died - one in eight of total global deaths – as a result of air pollution exposure. Will the Anthropocene last for only 100 years?